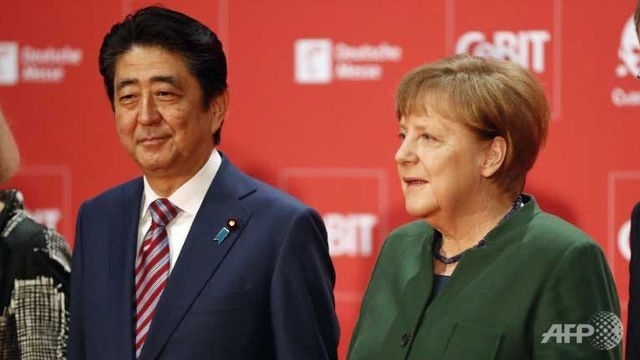 German Chancellor Angela Merkel and Japan's Prime Minister Shinzo Abe issued a staunch joint defence of free trade on Sunday (Mar 19), as the United States pushes towards greater protectionism. "We want free and open markets," Merkel said in a speech in Hanover, a day before the world's biggest computer trade fair, CeBIT, kicks off in the central German city. The event is partnered with Japan this year. "In these times of inter-connectedness, we want to link together our societies and work together in an equitable way. That's what free trade is about," she said. She made no direct reference to US President Donald Trump, elected on a protectionist "America First" platform promising to slash trade deficits, but noted that the European Union and Japan are negotiating a free trade deal that may be reached this year. "At a time when we are arguing a lot over free trade, open borders and democratic values, it's a good sign that Japan and Germany are not arguing" over trade, she said. Abe, who is in Hanover as part of a European tour, said that Japan "wants to be the champion upholding open systems alongside Germany". He said it was through connectedness that economies would grow, and called for a swift conclusion to the EU-Japan trade deal. But he added: "We must not create conditions by which wealth becomes concentrated among only some people." 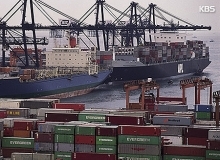 At a fraught G20 meeting in the German spa town of Baden-Baden on Saturday, the US challenged long-standing global principles surrounding free trade, refusing to renew past anti-protectionist pledges and threatening to reopen negotiations on World Trade Organisation deals. Since taking office, Trump has withdrawn the US from a trans-Pacific free trade pact and attacked export giants China and Germany over their massive trade surpluses.